This entry was posted on 28 November 2014 at 4:05 pm	and is filed under Solving Blogs. 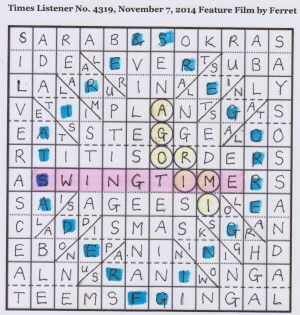 Tagged: Feature Film, Ferret, Rogers Astaire, Swingtime. You can follow any responses to this entry through the RSS 2.0 feed. You can leave a response, or trackback from your own site. Thank you for your highly entertaining and delightfully illustrated blogs each week for Listen With Others. Just catching up on the last three months of Listeners and very impressed by Ferret’s brilliant construction! Sadly do not have the puzzle to hand to clarify why the S of Rogers and the F of Fred are barred off, and, on watching the movie clip, why the staircase is mirrored? The upper half of the origami seems to represent the shape of the staircase as shown in the Silver Sandal nightclub with the lower part as a reflection. I believe the F and S were barred off since they were not clued but had to be inserted as part of the final game, demonstrating that we had, in fact, recognised that Rogers and Astaire were dancing up the staircase. 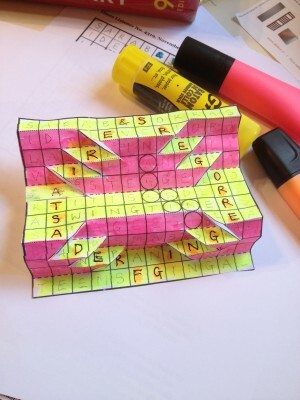 There was no actual requirement to construct the staircase (though it proved to be entertaining to do so) and a solver could have completed the grid without resolving the endgame, had it not been for those two letters. I think I might have forgotten to highlight “swing time”. Only one way to find out, I suppose! Thanks for the explanation about the S and F. Referring back to the Listener Crossword website didn’t help me with this point. I assume that the split in the staircase was therefore setter’s creative license in order to accommodate the words SWING TIME satisfactorily. Ferret would have to confirm. Thanks Shirley, and all the best with your own creative activities.